Intercity Transit currently has no plans to detour or close any stops on Route 62A. This could change if heavy traffic causes significant delays on the route. We will make every effort to alert riders in advance of any changes. Riders should be prepared for delays due to congestion, as well as changes to the route if necessary. We will provide updates on any potential changes to our service here, on Facebook and on Twitter. You can also sign up to receive real-time information from Intercity Transit via email or text message at intercitytransit.com/subscribe. If you would like additional information about this project and projected impacts, please see the Washington State Department of Transportation's project webpage. 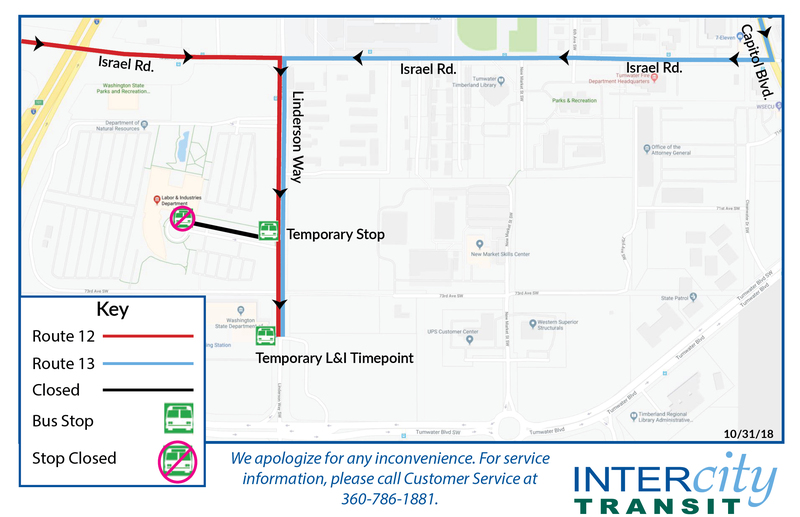 Routes 12 and 13 won't be able to access the bus stop at the front entrance/roundabout of the Labor & Industries (L&I) building in Tumwater Dec. 3, 2018 - May 14, 2019 due to a construction project at the facility. During the project, please use one of the temporary bus stop located on Linderson Way or by the Department of Corrections. The Department of Corrections stop will become the L&I timepoint for the duration of the project. Please see the map below for additional details. We apologize for the inconvenience. For service information contact Customer Service at 360-786-1881.